Because March is Women’s History Month it’s the perfect time to take a look at one of Florida Tech’s many amazing women, Sunita Williams. After earning a master’s degree in engineering management from Florida Institute of Technology in 1995, Williams went on to become one of our country’s most accomplished astronauts. Williams graduated from the United States Naval Academy in 1987 and was commissioned as an Ensign. Thereafter she received the designation of Basic Diving Officer and reported to Naval Aviation Training Command. Consequently, she was designated a Naval Aviator in 1989. As part of a Helicopter Combat Support Squadron, her deployments included the Mediterranean and the Red Sea. In addition she also traveled to the Persian Gulf in support of Desert Shield and Operation Provide Comfort. Also, in 1992, she was named the Officer-in-Charge of a detachment to Miami for Hurricane Andrew Relief Operations. Williams, a U.S. Navy Captain, was selected for United States Naval Test Pilot School in 1993. Eventually logging 3,000 flight hours in more than 30 different aircraft. 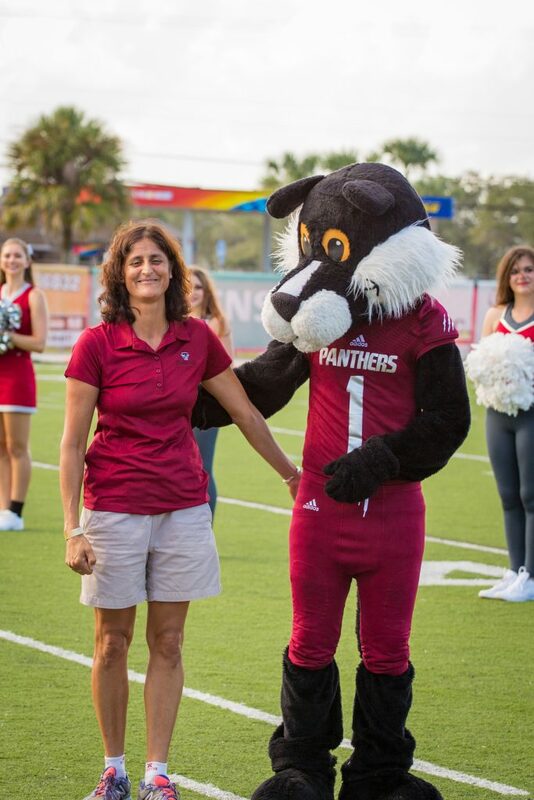 Astronaut, U.S. Navy Captain and Florida Tech Alumna Sunita Williams served as Grand Marshal of Florida Tech’s Homecoming Parade in 2015. In 1998 she was chosen to be part of NASA’s astronaut program and went on to spend 322 days in space on two missions to the International Space Station. As a result Williams holds the record for total cumulative spacewalk time by a female astronaut at 50 hours, 40 minutes. Her first mission in 2006 was on board the Space Shuttle Discovery as part of the 14th expedition to the International Space Station where Williams served as flight engineer. Another mission to the space station took place in 2012 on a Russian Soyuz vehicle. Florida Tech presented Williams with the Jerome P. Keuper Distinguished Alumni Award in 2015. Because in 2015 Sunita Williams was chosen for NASA’s Commercial Crew Program. In partnership with commercial companies, NASA is designing spacecraft systems that can launch astronauts into low orbit and the International Space Station. The spacecraft include the Boeing CST-100 Starliner and the SpaceX Dragon. In addition, the new designs are planned to be safe, reliable and affordable. And Williams be among the first group of astronauts to fly this next generation of commercial crew vehicles. Other members of her group include; Eric Boe, Robert Behnken and Douglas Hurley.